I’m glad I caught this at Arcade Renaissance as I nearly forgot about Dynamite Deka EX. In case you did, this is a new 3D scrolling beat ’em up that is a sequel to the original Dynamite Deka (also know as Dynamite Cop). The new features that Dynamite Deka EX has however is the ability to change costumes and the addition of some mid-level mini-games. It’s nothing revolutionary but it’s a beat em’ up and I love these games. While many people (including myself) were disappointed that Sega decided not to bring this game to some more powerful hardware such as Lindbergh, the fact that it’s available for the NAOMI platform should mean two things: it’s relatively cheap and can be easily installed in a number of locations. It certainly doesn’t appear that it will see a wide release outside of Japan, but thanks to Coinopexpress you can pick it up for only $1182.72 (what a nice rounded number). Also the Dynamite Deka EX website has been updated with new art and a totally different layout. Most everything is in Japanese but you should be able to navigate the site without much of a problem and check out a number of small screenshots for the game. KOFMIA was also supposed to be available today but Coinopexpress lists the price as TBA, but they did take it off the ‘Coming Soon’ list. The lack of a price is strange since at one time they had listed it as carrying a price tag of $2771. Perhaps they is a slight delay with the game. It appears as though Paradise Lost is doing very well in the arcade marketplace. So well in fact that the developers of the game, Signature Devices is earning royalties off the game and they are looking to work with GlobalVR again on their next big project. At this point what the game will be exactly is unknown (I wonder if they will work on Blazing Angels or not, another Ubisoft title – GlobalVR has said that they were going to release BA to arcades sometime this year but so far we have not heard anything beyond that) but the press release does say that the game will be designed for the new VR4 stand-up arcade machines that are supposed to be released later this year. Personally I have not heard of these new cabinets yet so if anyone has any information on them, it would be good to know. If they are an upgrade of the old Vortek cabinets that would be an interesting move but I will hold my tongue on that for now. At the very least it’s great to see GlobalVR aggressively developing new arcade titles – I think they are really shining now and are starting to show up Sega and Namco. Hit the post break for the full press release! 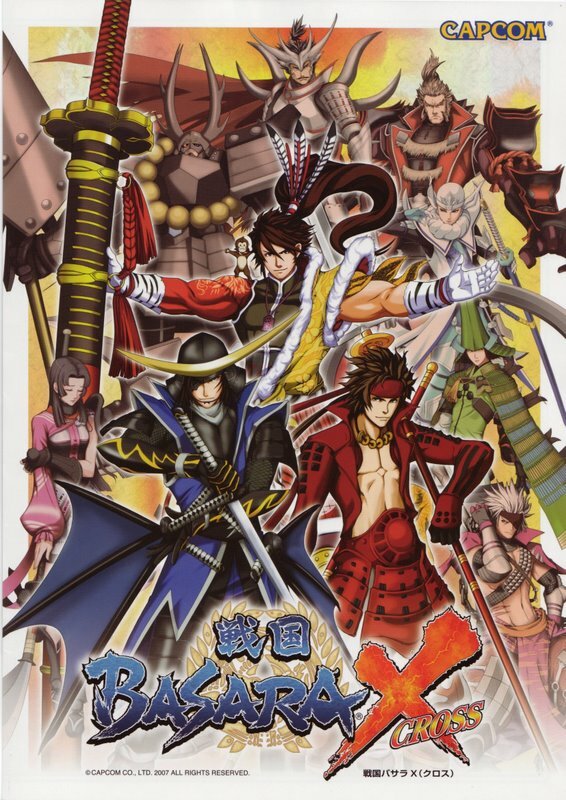 Capcom has held a private show where their upcoming 2D fighter Sengoku Basara X made an appearance. 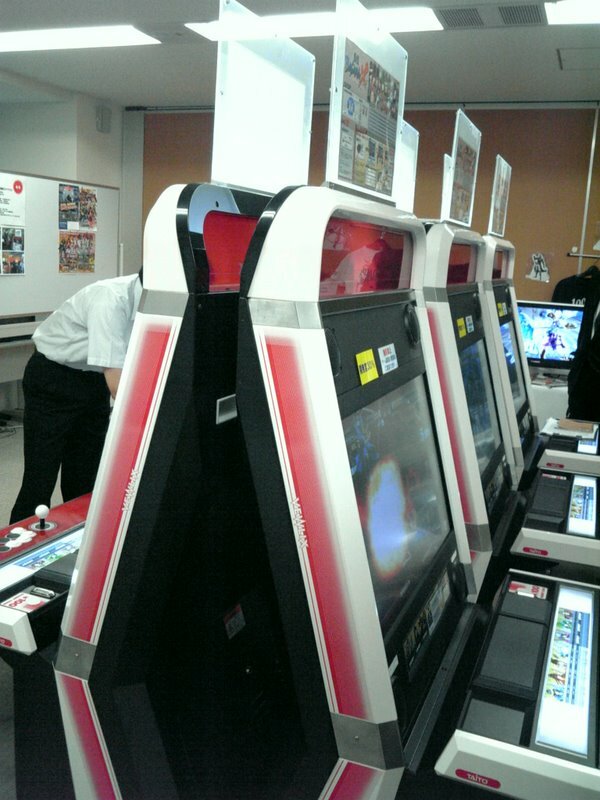 Housed in the new Viewlix Taito cabinets (which uses an HD flat-panel monitor capable of at least 720p resolution and is used by Battle Fantasia and King of Fighters Maximum Impact Regulation A) attendees were able to get a taste of Capcom’s newest entry to the arcade market. Rumor has it however that Taito may not end up distributing the title and Capcom will release the game as a separate kit to anyone they please. This is certainly surprising and hopefully it means Capcom will get on the ball with arcades again (this is just speculation on my part of course). Capcom also demonstrated a Pokemon Kid Vendor machine, some coin pusher titles and another medal game called Alien DANGER. Sadly War of the Grail was nowhere to be seen and if the game isn’t seen at the upcoming JAMMA event it might indicate that they no longer are developing for the Type X platform. I hope that it does show up however – the arcade seems to be the perfect environment for a Dynasty Warriors style game. 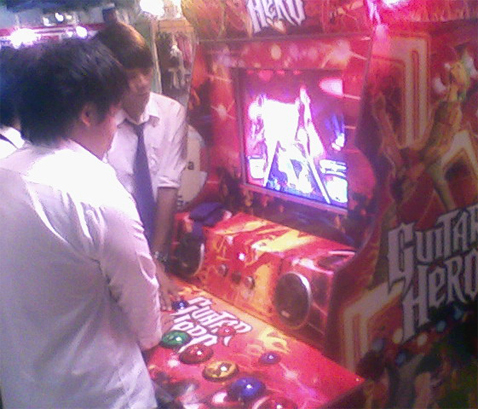 Way back in the day, when Arcade Heroes was in it’s infancy, we posted up a picture we found on flickr of what appeared to be a Guitar Hero Arcade cabinet minus guitars. Well low and behold here’s another one. Suffice to say this is not likely to have anything to do with Activision. Why o why doesn’t some one make this in to a genuine arcade game? Thanks Jonathan for the tip. 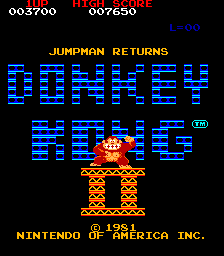 ArcadeShop.com unveiled that they will be selling a hack of Donkey Kong called Donkey Kong 2: Jumpman Returns starting on August 20th. The hack has been in the works for the past two years and aims to bring a sequel of sorts to Donkey Kong by letting you go higher up the ladder with four entirely new level designs: The Foundry, The Mixer, The Refinery and The Incinerator. HyperSpace Arcade has a very interesting article up about the hack where the creator explains the process of designing the new levels along with pictures. If you are a DK fan and would like something new, then this is certainly up your alley. The latest Classic Gaming Expo has come and gone and with it collections of pictures from some of the attendees of the event. 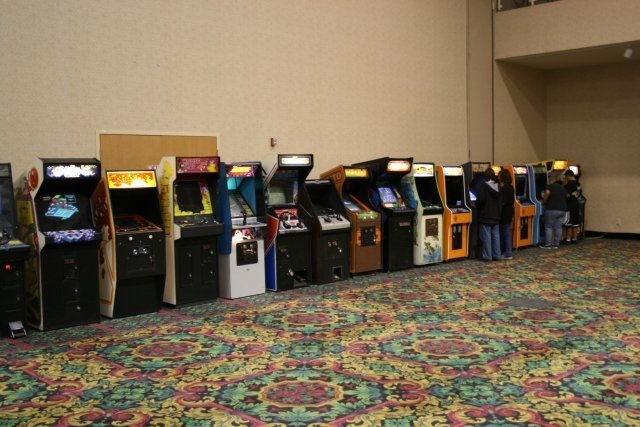 While the focal point of CGE is gaming consoles, that didn’t stop people from brining their classic arcades to the event and as such there were around 50 classics there for people to play for free. They even had a Warlords Cocktail cabinet there – a personal holy grail for myself that I would like to have for my personal collection one day. Beyond really cool classic arcades, they had a variety of interesting and unique classic gaming systems and games there – I even saw an Atari Cosmos in one of the pictures (they are super-rare and super valuable – it was supposed to be some sort of game system to use holograms) and a Vectrex. Hit the links below to check the pictures out.